Every Powerline reader who follows my articles knows that the risks of simply storing and ignoring diesel fuel are too great. Preventive measures are necessary to protect the equipment and fuel and ensure that backup power is there when you need it, every time. The fuel in most diesel generator tanks is likely to be stored for extended periods of time and should be monitored according to the standards for long-term storage. As I have noted before, all generator operators should be aware of four significant facts about the fuel they use and store. Ultra-low sulfur diesel (ULSD) is a fuel with challenging properties and characteristics that were not present in the fuels we used to store that contained more sulfur. As fuel transfers from vessel to vessel on its way from the refinery to a generator storage tank, it is exposed to many contact points where it can acquire contaminants. ULSD is a highly refined fuel with molecules that can break up under stress and cause the fuel to degrade. 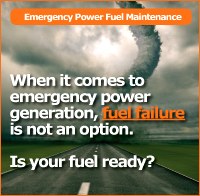 When contaminated and untreated, diesel fuel can cause severe damage to storage equipment—and even to generator engines. Given these facts, fuel analysis should be a routine part of any annual PM program. Operators need to commit to a testing regimen so they understand what is happening with their fuel, and they can protect their storage assets. In this article we will examine the different fuel testing parameters and the vital importance of ensuring secure fuel storage systems and overall fuel reliability. There are many different fuel tests that a fuels laboratory can perform. The widely accepted ASTM test methods are used to ensure that ULSD conforms to the D975 specifications. The parameters in these tests simply define diesel as meeting the specifications (or not meeting them) and do not address essential issues of contamination or stability. The changes that fuel undergoes after refining are largely due to the dynamic nature of refined petroleum products. The processes that fuel is exposed to at the refinery level are extreme and result in making fuels that are not happy staying in the same state after they leave the refinery. Add to that the potential sources of contamination, and it becomes clear that determining the degree of changes and the presence of any contaminants are critical both for reliable operation and for protecting the entire fuel storage and metering system. 1. Fuel Stability. It makes perfect sense to uncover any fuel contaminants that might be present and determine to what degree the diesel fuel has undergone chemical changes since leaving the refinery. Fuel stability—and instability—can be understood as the potential of a fuel to generate solids and particulates from the fuel itself. Over time fuel loses stability, and particulates fall out of the fuel at an increasing rate. Hydrocarbons can be sticky, and they agglomerate into larger particles as a product of their natural dynamic chemistry. Stability test parameters may include oxidation stability, thermal stability and repolymerization stability. Oxidation and thermal stability are well understood forms of fuel stability and are easily tested. Repolymerization is much less understood by most fuel labs, but it is vital for determining how chemically active a fuel is on a different level. A predictive test is what can make the difference between understanding where a fuel is now, and whether it is likely to degrade in six, 12 or 24 months. The average diesel fuel today has a typical shelf life of six months before it begins generating solids, particulates, gums and varnishes, which are all usually primarily hydrocarbons. This is the stuff that drops out of fuel, can be suspended in fuel, and collects at the bottom of a tank, as well as on all fuel-wetted surfaces. Filters do their jobs in capturing this stuff, but with generators, there is an ever-present likelihood of an extended engine run that can cause a filter to get overwhelmed by a degraded fuel, which can cause an engine shutdown. There is even more to know about this threat. When particulates form because of poor fuel stability they can also attract any other contaminants that may be in the tank or fuel and add to the complexity of the problem. Dirt, sand, rust, microbes and metals can become embedded in fuel particulates and not only contribute to shutdowns but cause engine damage that necessitates expensive repairs. Given the risks, testing for fuel stability is imperative. By detecting threats in advance and keeping fuel stable, operators can reduce particulate formation and the associated threat of fuel particulates blending with sediments. Generator operation becomes more reliable, and the risks of engine shutdowns and damage diminish. 2. Presence of Water. Water is a common contaminant found in diesel fuel and fuel storage tanks that needs to be monitored routinely. The presence of water does many harmful things, such as hastening fuel oxidation instability. Periodic sticking of a tank with a fuel level monitoring stick coated with water finder paste is a simple, low-cost step for proper tank housekeeping. Most large bulk storage tanks use an electronic probe for water monitoring as well as leak detection. Smaller tanks can be challenging to stick for water, so fuel analysis testing for water is the better option here. Keep in mind that ULSD has a greater affinity for moisture, so the presence of water is a greater threat than ever before, and operators cannot afford to ignore the threat. Fuel testing in the laboratory for presence of water in fuel is just as important as sticking tanks for water presence in a tank. Water finds its way into storage tanks through condensation which a normal part of fuel storage as a tank “breathes” through the tank vent. Water can also be delivered with the fuel when a delivery is made, if the fuel had contact with moisture in the distribution process. Rainwater can find its way in through numerous ways in tanks that are outdoors. The important point is that water is almost impossible to keep out of fuel storage tanks, and routine monitoring by laboratory testing is necessary. Water accumulation provides a favorable environment for corrosion to occur and for microbes like bacteria and fungus to grow. This has become a major issue that can affect any business that stores ULSD. Removal of water periodically by simply pumping off the bottom, tank cleaning and fuel polishing is an effective way to minimize the corrosion and microbe growth problems. Treating with the right additive is also an integral part of managing water and its negative effects. If you don’t test for water, you do not know whether it is present, and the risks of not knowing include generator failure. 3. Microbe Count. Another essential element of a thorough fuel monitoring program is testing for microbe count. Typical testing for microbes involves culturing in the laboratory for bacteria, fungus, yeasts and molds, and it takes 48 to 72 hours before results are available. Microbial-influenced corrosion is a major issue in storage tanks and fuel metering systems, so it is important to identify any microbes that may be present. Fuel should be tested for microbes at least once a year. Even in the absence of microbes, corrosion of metallic components and tanks can occur. Water is the electrolyte or pathway that allows corrosion to take place, and microbes simply accelerate the process. In addition to corrosion, microbes contribute to the formation of particulate and sediment that leads to filter fouling and premature filter changes. The buildup of this sediment can form a bio-film type of slime that can cause all sorts of fouling and corrosion in fuel metering equipment. Nothing good comes from overlooking microbe testing and putting equipment at risk of the well documented problems with accelerated corrosion and fouling problems. Treating fuel with a preventive maintenance dose of an inhibitor that discourages microbe growth is an extremely effective tool in the fight against this issue. 4. Organic and Inorganic Contaminants. Organic and inorganic contaminants are two more important parameters that should be part of a fuel analysis testing routine. Examples of organic contaminants can be dirt, sand, dead microbes, fuel polymer, off-spec biodiesel, etc. Any of these can mix with fuel particulate or sediment and build up over time. Considering that any foreign substance in fuel can lead to generator shutdown—or worse yet, engine damage—testing for organic and inorganic contaminants is a must at least once a year. To summarize, diesel fuel that is compromised in quality can render a generator inoperable at a crucial moment. It can also damage tanks and equipment. Rigorous, systematic testing in required to ensure quality and detect problems. Operators need to understand that testing fuel for specification compliance is not enough, because specification tests are not designed to detect real-world threats such as instability, presence of water, microbes and organic or inorganic compounds. It is the job of generator maintenance specialists and contractors to minimize risk in a cost effective manner using best practices to monitor fuel annually. This segment of your preventive maintenance service routine is not only smart; it is necessary to ensure fuel and equipment reliability. Mark Stellmach is President and Owner of Fuel Management Services, which supports the on-site power industry with fuel quality expertise. Mark has 24 years’ experience helping fuel providers and service companies to improve the quality and reliability of their distillate fuels. He uses his expertise in the properties and characteristics of middle distillate fuel chemistry while relying on the company’s world class fuels laboratory. With a deep and thorough understanding of fuel properties, Mark helps companies navigate the challenges to fuel quality in storage and provides them with treatments and test procedures that minimize fuel-related problems and optimize equipment performance. His company provides solutions, education and consulting for companies to manage fuel quality, ensure fuel stability and eliminate all potential fuel and tank contamination problems. Mark has extensive experience managing ultra low sulfur diesel (ULSD) fuel under all conditions. He is well versed in fuel refining, fuel contamination, fuel additive chemistry, and corrosion control for storage tanks and fuel distribution systems. He has provided support across several industries, including emergency power, utilities, diesel transportation, military, and heating oil delivery. He holds a BA in business administration from Rider University, and his interests include surfing, skiing, biking and travel. 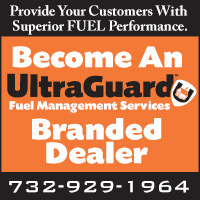 For more information, please visit www.fuelmanagementservices.com.